Our cheese is special because the people who milk the goats are also the people who make the cheese. Unlike some bigger dairies that produce cheese in larger batches, our milk comes fresh from our goats every day, so we hand-make our cheese in small batches almost daily. It’s a true labour of love… and one that produces outstanding artisan cheese. We run an “open barn” policy so the goats are free to choose to stay undercover or graze on the 39 acres of grass fields. 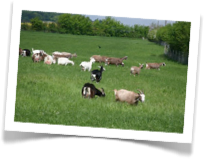 We have a mixed dairy goat herd, all selected for their fine quality milk. Our cheese tastes so good because our goats eat so well! we consistently get the best quality milk, which in turn makes the very best quality cheese. Great care is required with goat feeds because if the animals’ diet is changed, you can taste the difference almost immediately in the milk. A lot of the variance in the taste of goat’s cheeses around the world is down to the animals’ differing diets. Here in the UK, the grass is very sweet, creating cheese that is less "goaty" than other European goat's cheeses. This year, we also planted 33 acres of Alfalfa and Italian Rye Grass to add to the feed ration. We manage every aspect of production, from what the goats eat to the finished product that we sell wholesale and at farmers markets and food festivals. 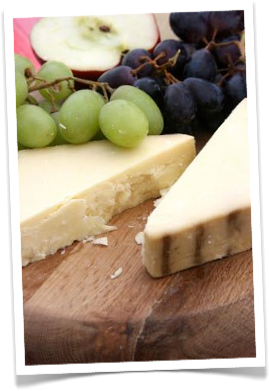 We are confident you will enjoy our fine goat's cheeses and gourmet cow’s milk cheddars and look forward to serving you.